The Tennessee Titans, previously known as the Houston Oilers began play in 1960 as a charter member of the American Football League. Based in Nashville, Tennessee Titans rank number six in National Football League and is considered one of the most talented teams in professional American football. Houston Oilers was owned by Bud Adams, a Houston Oilman. His desire to provide state-of-the art facilities to his team prompted him to move from Houston to Nashville. To align themselves closer with the people of Nashville, Adams changed the name of his team to Tennessee Titans and decided to coincide it with the opening of Nashville football stadium, now known as LP Field. Led by their Head Coach, Jeff Fisher, over the last eleven seasons from 1999 to 2009, Tennessee Titans have made six playoff appearances and won three Division titles in 2000, 2002 & 2008. Along with two AFC Championship Games under their belt and one Super Bowl berth, Titans have been soaring high under the inspiring leadership of their coach. Over the years Pro Football Hall of Fame has acknowledged several Tennessee Titans players, most of who were in the team when it went by the name of Houston Oilers. Defensive end player Elvin Lamont Bethea, quarterback George Blenda, running back Earl Campbell, defensive back Ken Houston, offensive lineman Bruce Matthews, quarterback Warren Moon and football guard Mike Munchak were among the notable players who made it to Pro Football Hall of Fame. Tennessee Titans play their home games at LP Field in Nashville. The stadium seats approximately 68,798 fans and has a state-of-the-art, open-air, natural grass facility. During Tennessee Titans game the stadium is filled to its capacity by loud, loyal fans that are present to support their team. Team’s official mascot raccoon who mostly goes by the name T-Rac, with his goofy and energetic antics leads the Titans fans into cheers. Titans manage to be a formidable adversary and are always expected to give opponents a hard time even in the toughest divisions in the NFL. The team did a good job in 2009 and finished the season with an 8-8 mark. Titans became the first team in NFL history to win more than six games in a season after starting 0-6. With the football season approaching Tennessee Titans will be looking to better its last years stats. Titans 2010 team will be giving new talent a chance as well as expecting from its existing players to bring home glory. Coach Fisher is counting on several players to bring out their best this season. After showing his tantalizing abilities during OTAs and the preseason, wide receiver Lavelle Hawkins, will definitely play an important role in team’s passing attack this year. Jason McCourty is another player that looks promising this year as his performance during OTAs won him rave reviews and his chances of stepping up to the challenge are pretty good. Having a brilliant season last year, Chris Johnson has emerged as one of the NFL’s top young offensive stars. His world-class speed and big-play ability to the rushing attack will definitely add to the Titans strength this year as well. Other players to look out for are quarterback Vince Young, tight end Jared Cook, linebacker Gerald McRath and running back Javon Ringer. Under the leadership of Coach Jeff Fisher, Tennessee Titans have managed to develop a solid rushing defense, the ability to possess the ball with a strong running game and poise in the midst of adversity. Being a former NFL player he has used his experience to develop a tough team. Football season is around the corner. Will the Titans be able to get their offensive production up or keep the defense playing at a superior level? To find out get your Tennessee Titans Tickets now! Make sure you are there in the crowd when the Titans take down the opponents. There is no love lost between the Tennessee Titans and the Houston Texans. The history between these two sides dates back to the year 2002, when as a result of the NFL realignment they were put in the AFC South. There is hardly anything to choose from between them right now in terms of head-to-head record. They have squared off on thirty one occasions till now and the Titans have their noses in front by winning sixteen games. The other fifteen have been won by the Texans. The Tennessee Titans and the Jacksonville Jaguars met on the football field for the first time on September 3, 1995 in a clash that was played at the EverBank Field. The Titans, known as the Houston Oilers back then, triumphed 10-3. The animosity reached new levels in the postseason of 1999-2000. The Jaguars were leading 14-10 at HT but the Titans roared back to win 33-14. The Titans lead the regular season head to head record 25-20. That 1999-2000 playoff meeting remains the only time that these two teams have met beyond the regular season. The Tennessee Titans also have a rivalry with the Indianapolis Colts. The Titans and the Colts met for the first time way back on October 11, 1970. Since then the head-to-head has been quite one sided in favor of the Colts. The team from Indianapolis has won thirty one regular season games compared to the Titans’ fourteen. They have also met once in the playoffs and that clash was won by the Titans. The rivalry between the Tennessee Titans and the Pittsburgh Steelers goes back a long way. These two sides were once members of the AFC Central and met for the first time on September 20, 1970. The Titans came out on top in that encounter 19-7. The Steelers however have stolen the march on the Titans since then when it comes to the games played between them. The head-to-head regular season record is in favor of the Steelers 42-31. They have also met four times in the postseason and the Steelers have won three of those clashes too. The Tennessee Titans have finally snapped their losing streak against the Indianapolis Colts. The Titans took on the Colts at the Nissan Stadium and came out on top 36-22 to notch up their first win against the team from Indianapolis since October 30, 2011. The win not only ends their eleven game losing run against the Colts but also puts them at the top of the AFC South with the Jaguars and the Texans. The Titans are looking good this year and they will be hoping to carry this momentum in their next encounter the Browns. Football season is here and is packed with epic matchups. You can catch all the action live as it happens. Next event featuring Tennessee Titans will be NFL Preseason: Philadelphia Eagles vs. Tennessee Titans, held at the Lincoln Financial Field in Philadelphia. As of now, the last event, Tennessee Titans vs. Los Angeles Chargers is scheduled for 20-Oct-19 at the Nissan Stadium - Nashville in Nashville. For complete itinerary of events, please visit our website. The average price for Tennessee Titans Tickets start from $71. The minimum get in price is $12 for Tennessee Titans Tickets at the Soldier Field Stadium, Chicago. For a detailed look at ticket prices and amazing discounts, visit our website. Use Event18 as the discount code and get up to 70% discount on Tennessee Titans tickets. This is a last minute opportunity to get the discounted tickets for Tennessee Titans. Q:Is it safe to buy tn titans tickets 2018 online? A:Yes it is safe to buy Tennessee Titans Tickets online from us as we offer hacker free facilities and are certified with recognized authorities. Q:I want to get discount tenessee titan tickets. Can you help me with that? A:Yes. You just have to use the codes mentioned on the page of Tennessee Titans Tickets for getting discount. Q:Are you offering tennessee titan tickets 2018? A:Yes, we are offering Tennessee Titans Tickets for sale and that too on discounted rates. Check it out and place the order right away. Q:Can i get two for one tn titans tickets? A:There is no such discount offer for Tennessee Titans Tickets. You'll can get them on individually discounted rates. Q:What is the best place to get cheapest tennessee titans tickets? A:We are offering quality tennessee titans Tickets with a comfortable seating arrangement on comparatively cheap rates. Check the details and order right away! Q:I just found out, i would not be able to make it to the evnert. Can i return my tennessee titans tickets 2018? A:No, as per the company policy, tennessee titans tickets 2018 cannot be returned. Sales once made are considered to be final. Q:Do you a special section reserved for discounted tennessee titans tickets? A:The inventory reserved for Tennessee Titans tickets contains the cheaper tickets in the top of the index. Q:Would seats for discounted titans tickets be good? A:You can select Tennessee Titans tickets with help of site map. For more discount on them, get your promo code from the help person. Q:I have already bought my discounted nfl game tickets. Where can i view the seating map? A:Please go to Tennessee Titans tickets page on our site. Over there you will find the option of viewing seating map. Q:Is it possible to get a refund on my discounted nfl tickets? A:I am sorry but your Tennessee Titans tickets cant be refunded. Its against our policy and mentioned in the terms and conditions. Q:When will my cheap tennessee titans tickets be delivered to me? A:Your Tennessee Titans tickets will be delivered to you within the specified time. If you experience any additional delay then please contact us on the given numbers. Q:Do i have to be a member to get tennessee titans tickets coupon code? A:No you don't.Tennessee Titans tickets coupon codes can now be obtained by everyone looking to buy cheap tickets. You can now easily get them from our live operators. Q:Can i get special discount if i buy 5 titans tickets? 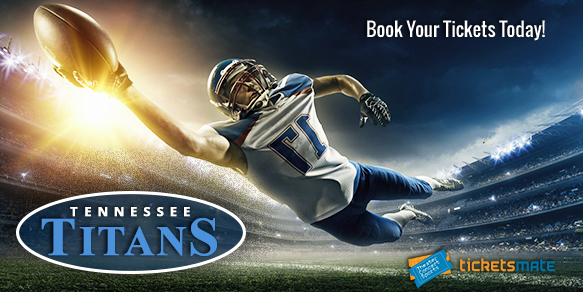 A:Tennessee Titans tickets are already available at the best discounted rates. You wont find rates better than this anywhere else. Q:When will my cheap titans tickets be delivered to me? A:Your Tennessee Titans tickets will be delivered to you within the specified time. In case there is any additional delay then please contact us on the given numbers. Q:Can I buy titans tickets on phone? A:Call at 866-861-4784 to book your Tennessee Titans tickets. Q:I need to buy tennessee titans tickets at discounted rates. Please help. A:Not a problem as you are in the right place. Take a look at our inventory and go all hallelujah at our cheap rates of Tennessee Titans tickets. Q:I want to get best seat for titans game. A:Thousands of Tennessee Titans Tickets are available in our inventory. Log on and find the best tickets for yourself.